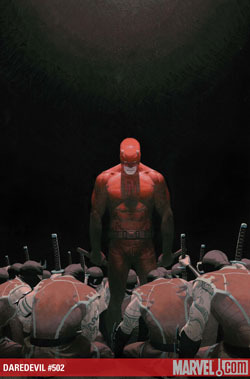 The new creative team keeps up the high level of work from last issue with Daredevil #502. In some ways, I would even say that they manage to crank it up a notch. However, this issue has a slightly disjointed feel to it that brings the score down a bit for me. The whole manages to pack less of a punch than the sum of its parts, if that makes sense. Many of the scenes in this issue are absolutely wonderful on their own, but the overall plot feels like it’s stalling, just a little. I always like to read other people’s reviews before writing my own, not because I can’t think of anything to say, but because it’s interesting to see what kinds of things other readers react to. This time around, a certain reversal of events mid-issue has had reviewers bemoaning the inability of writers to truly advance the status quo while acknowledging the hazards of making a character into something he’s not. Since I’m no stranger to advance solicits, I was expecting this particular chain of events, and I have to say that it’s really the only way to go. I’m all for shaking things up with this character and his book, but we need to remember that there are certain core values and characteristics we’ve come to associate with Daredevil and his cast. These cannot simply be tossed to the side without losing something important in the process. On the contrary, this issue solidifies my belief that Diggle has a firm grasp of the character and his motivations. The scenes that stand out to me (well, besides the Owl being fed mice – “V” style) are the longer dream sequence and the two remaining thirds of Nelson, Blake & Murdock making a court room appearance. The dream sequence still doesn’t make complete sense to me – particularly when it comes to Matt’s sudden awakening – but the trip through Matt’s psyche feels very true to his character, and features some absolutely stunning art (see below). The courtroom scene with Foggy and Becky shows some of the real world implications of living in Norman Osborn’s world, and serves to anchor the book in something very close to our own reality (though presumably a more corrupt version). Foggy seems about as fed up with Osborn’s pulling the strings behind the scenes as everyone else, and this issue sees Diggle push Foggy in a new interesting direction. I know opinions differ on this matter, but I, for one, am very happy to still see the regular crew appear in the book. I’ve already touched on the art, but man is this a great-looking issue. It’s both realistic and a little dreamy-looking and the colors are a little brighter than we’re used to. My only complaint has more to do with the composition than the look of the art. There are two longer scenes in this book that see three very non-flying superheroes suspended in mid-air in ways that don’t reveal just what building they just jumped off of or how they got there. 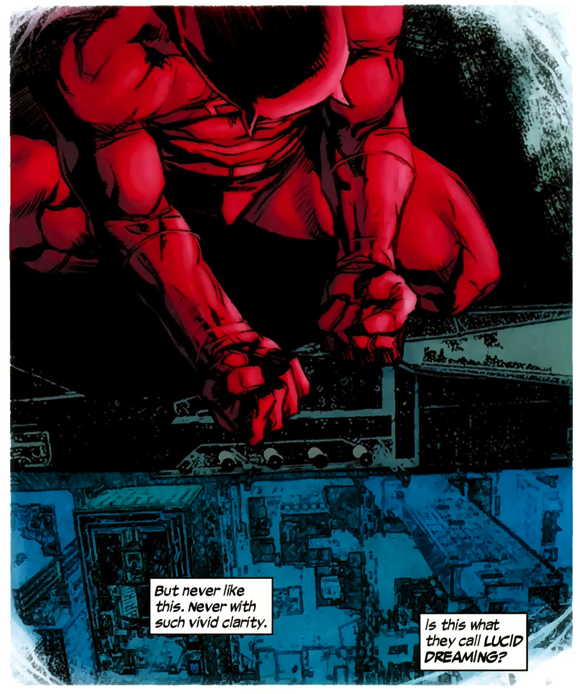 While Daredevil is certainly a skilled acrobat, I don’t want to see gravity completely done away with in this book. The days of Daredevil being Spidey with a billy club wire are long gone, and I don’t want to see them back. I’m looking forward to seeing where this is all going, and the issue leaves us with a cliffhanger I’m curious to see Diggle resolve next issue. Agreed with you, I’d give it an 8. I loved this issue, and the art is to die for. I agree with you that there’s a feeling of fragmentation, as far as the issue goes, but then the “one-issue” story is such a rarity in these days that I guess that it will all look better with the full story-arch completed. I though the plot was OK, specially since they are touching the fallout of Dark Reign instead of fighting Norman directly. But the best part of this issue was the art, I like how DD and his ninjas stand out in the dark environment.